Two taxis, one train and two flights later I’ve arrived in the Faroe islands. (Who knew that the EasyJet bag drop at Gatwick is the largest automatic bag drop in the world?) Landing involves banking through brown peaks and a dramatic approach across an emerald spit, falling away to a boiling blue sea. I’m told I’m lucky, as its unusual to see anything – there’s usually cloud covering these little volcanic islands. I’ve landed on the island of Vagar, but I’m staying in the tiny capital, Tórshavn (boasting it’s the smallest in the world), so my last taxi involves a journey east, through a tunnel to neighbouring Streymoy Island, navigating past towering flat top peaks still streaked with snow and a great deal more blue water. Nowhere here is further than three miles from the sea. The little houses dotting the hillsides are either modern and colourful, or more subdued creosote covered wood, with green turf roofs. The churches have quaint curved and carved spires. It’s all really delightful in the sunshine. Faroe means sheep, so these are the Sheep Islands and there are plenty of the animals (though at 80,000 not as many per head of population as in New Zealand), complete with frisking lambs, grazing the fields. They are penned in by stone walls and often accompanied by geese, minding clutches of fluffy goslings. There are no foxes (or rabbits) so there’s no need for too much protection from predators, though the same can’t be said for humans. I’m looking out for the reflective straps I’ve read that some farmers have started putting on their sheep’s legs so they won’t get run over in bad weather and poor visibility. There’s not a sign of a tree, except for small decorative specimens in people’s gardens. The sheep eat them before they have a chance to get established. Once in town, my driver tells me we are navigating two of the three sets of traffic lights in the country. 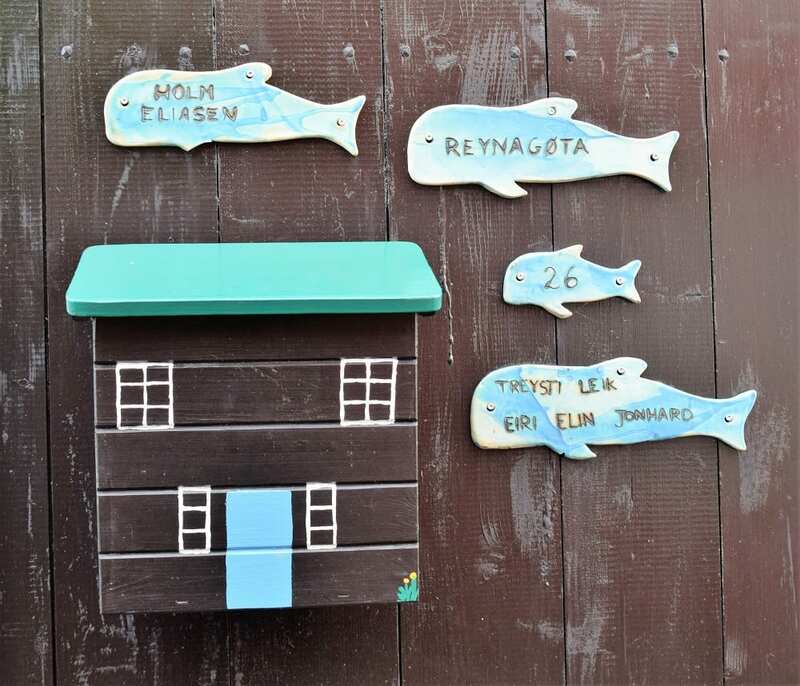 The last set is also in Tórshavn. My hotel is on the edge of a small peninsula, the old town, Tinganes, crammed with wooden turf-roofed houses. 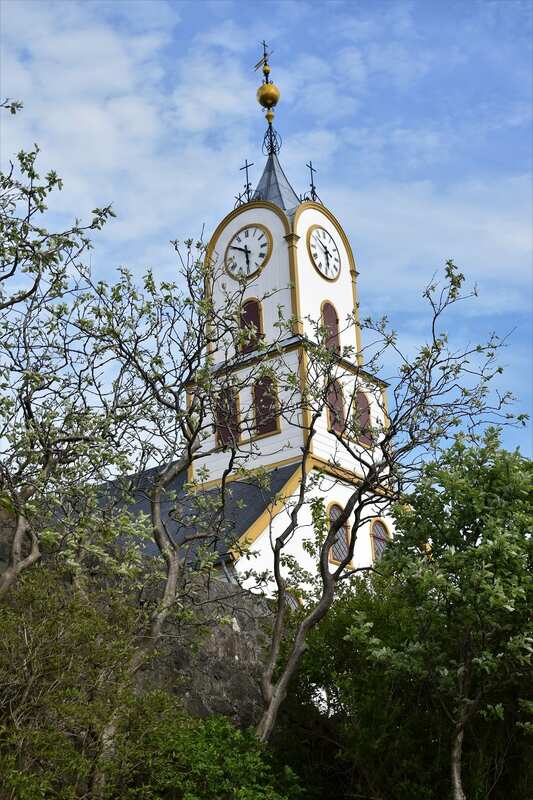 Just over the road is picturesque Tórshavn Cathedral, surrounded by little arty boutiques. There’s a harbour basin each side of the peninsula, packed with small boats and lined with chic quayside restaurants – and an Irish Pub. There isn’t a McDonalds anywhere (though I spotted a Burger King on the way in). 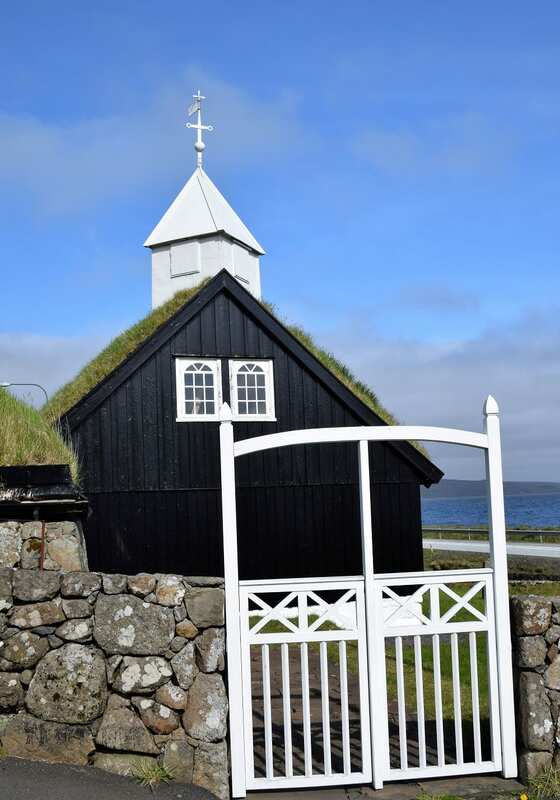 Nearly half the Faroese population of about 50,000 live in Tórshavn, which is named after the Norse God (so many Lutheran locals just call it Havn) and pronounced something like Tor-shan. The Faroe Islands are not that far from the southern end of the Arctic Circle, at 62 degrees north (that’s the name of my travel agent here). Average summer temperatures are 11C, so I’ve brought my woollies (and my Greenland boots too, just in case). My sources (other passengers on the plane) are excited to tell me that I’m going to have a very good week – the forecast is remarkably good – sun and cloud every day. Exposed to the Atlantic systems, it’s one of those places where they say, ‘If you don’t like the weather, wait five minutes’. Though, because it’s located slap bang in the midst of the Gulf Stream it never gets very cold either. A trip across the islands to the north. Back up Streymoy to Eysturoy. Down Eysturoy to the southern tip (opposite Tórshavn), north again and east to Bordoy and Vidoy with views across to Kirkja, Svinoy, Kalosy and Kunoy and home again. There are four tourists in a minivan (a Danish guy, his Thai partner, an Anglo Malaysian lady and me). Our guides are Samal and his grandson Marius, representing their family business. It’s a very small world. It turns out that I have worked in the school in Kingston where the Malaysian lady is on the admin staff and I have eaten in the Copenhagen restaurant that is one of several run by the two guys. The scenery today is nothing short of breath-taking, with soaring mossy peaks, waterfalls, patches of huge yellow buttercups (the national flower) and wild cobalt sea shores. 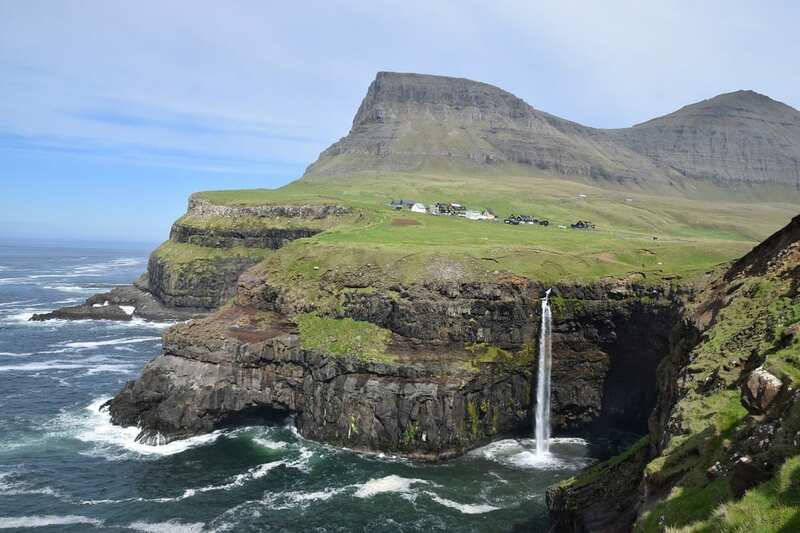 The Faroes are definitely worth a place on a bucket list. Think colourful Iron Islands. There are even a few Yara doppelgangers wandering around in wet look trousers and waistcoats. There’s an amazing network of tunnels (undersea and through mountain) and bridges linking the islands very efficiently, though they are still digging more tunnels to shorten the journeys. Streymin Bridge, connecting the island of Streymoy to Eysturoy is the only bridge in the world that actually crosses over the Atlantic Ocean. Some of the smallest islands are uninhabited and several are home to just one or two families who strive to eke out a living. Samal is incredibly knowledgeable and tells us about every building we pass on the winding roads, old peoples’ homes, kindergartens, shops and fish factories. These abound in the many little ports. Fishing is the islands’ single most important industry, providing more than 97% of the total exports. There are also fish farms in most of the fjords. Samal says that both these and the dairy farms are highly automated. The giant salmon rings are connected by tubes to a computerized mother ship which delivers dried food daily. They send a message for a diver if there’s a problem. (The second largest industry, perhaps surprisingly, is tourism.) Everywhere is pristine, clean and tidy, with touches of Scandinavian design in the newer buildings. The British provided the infrastructure when they occupied the islands during World War II. Most of the fish was exported to the UK at that time, for much needed food supplies. The Germans bombarded the fleets, so many fishermen died. When the war was over the British departed. Now I know where Douglas Adams’ ‘So long and thanks for all the fish’ came from. And the taxi driver was wrong about the traffic lights. There’s one more set in the most northerly islands, on a ‘busy’ junction, near a school. Back to Vagar, on another van trip with Samal. It’s really just an extension of the airport transfer, but absolutely worth the journey for the incredible views of the rock formations at the western tip of the island and the Mulafossur waterfall, dropping spectacularly into the sea next to two grottoes. You used only to be able to reach it via a long and arduous hike over the mountains, but the Danish queen visited a few years ago, so they blasted a new tunnel through to Gasaldur, where it is located. 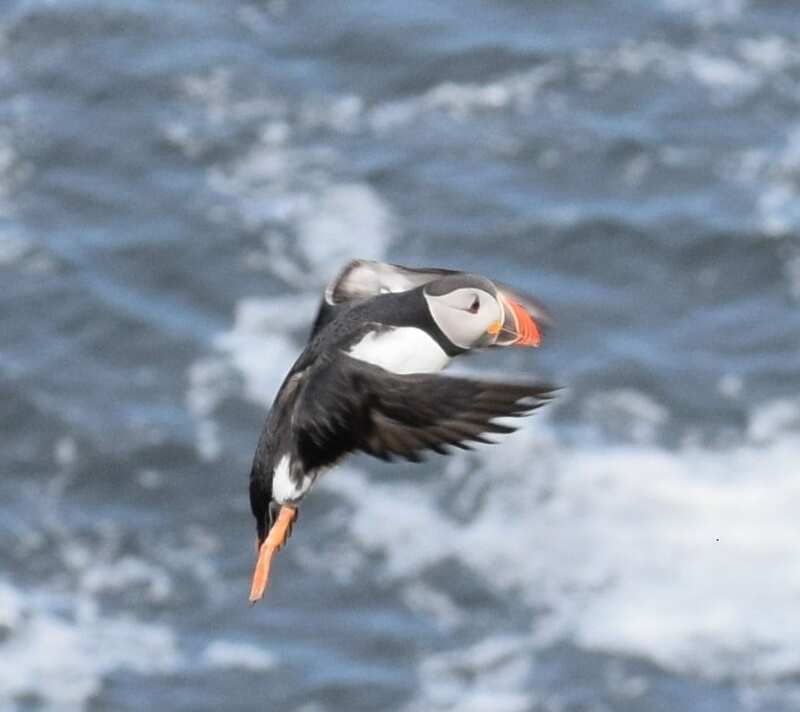 Puffins zoom in and out of their holes in the cliffs behind Gasaldur. They’re definitely my favourite bird, but hard to photograph as they dart so fast, wings twitching. 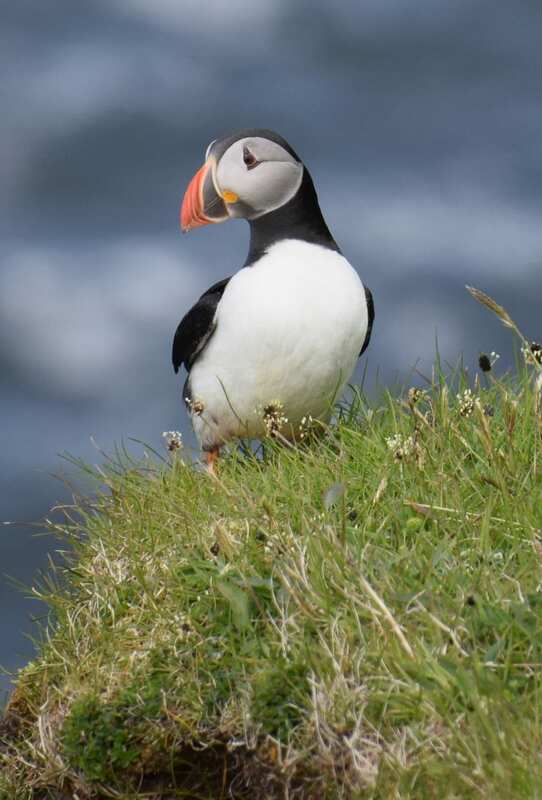 One takes pity and poses on the cliff top for us, until an unkind fulmar knocks him away. Most of the hotels and restaurants in town are owned by the same company. My hotel is one of them and it’s well located, but fairly mediocre; it was all I could find at short notice. It’s the beginning of high season and there’s a medical conference on in the Nordic Hall. Most of the upmarket restaurants are clustered together, at the land side end of Tinganes, a group of charmingly restored timber buildings. I’ve had to lie to get my table, as they don’t accept bookings for one person. I’m permitted entry when I arrive, unaccompanied, and I am served langoustine bisque, rack of lamb (what else?) and rhubarb compote. It’s nice, but not remarkably flavoursome. Then, a reconnaissance mission round the rest of the peninsula to work off some of the calories. There are a huddle of red painted, turf roofed government buildings at the harbour end. I discover that it is impossible to circumnavigate the point entirely without risking life and limb. My close encounter with the water tells me that it is incredibly clear. A friend has sent me an article that claims the Faeroese are desperate for more female islanders, as there aren’t enough wives to go round. I’ve been on the alert for possible suitors, but I haven’t seen any likely candidates, just a few grizzled old men with walking sticks. So, back to my little room. It’s hard to know when it’s time for bed, the nights are so short at this time of year. I’m using an aeroplane sleep mask. The Norwegians first settled here, so the area to the north I’m visiting (with Samal’s van again) is called Vestmanna (West Men). There are some Viking settlement remains and some colossal cliffs to visit by boat. It’s another beautiful day and all the locals are ecstatic; they say the weather this week has been extraordinary. En route we drive up the old military road and halt for a mountain top view over more fjords and islands. We blithely traipse over trodden down barbed wire fencing for a better look. Only I trip over it on the way back. I’ve now got two bloody knees and one bloody elbow. It’s the same elbow I banged in Micronesia, but I think I managed to save the camera this time. Out at sea, I still need my coat, hat and scarf and there’s a swell running. The captain shows off by bobbing his small craft through grottoes and around 100 metre stacks. Yet more wonderful scenery. Sheep graze in perilous positions on the cliff edges. 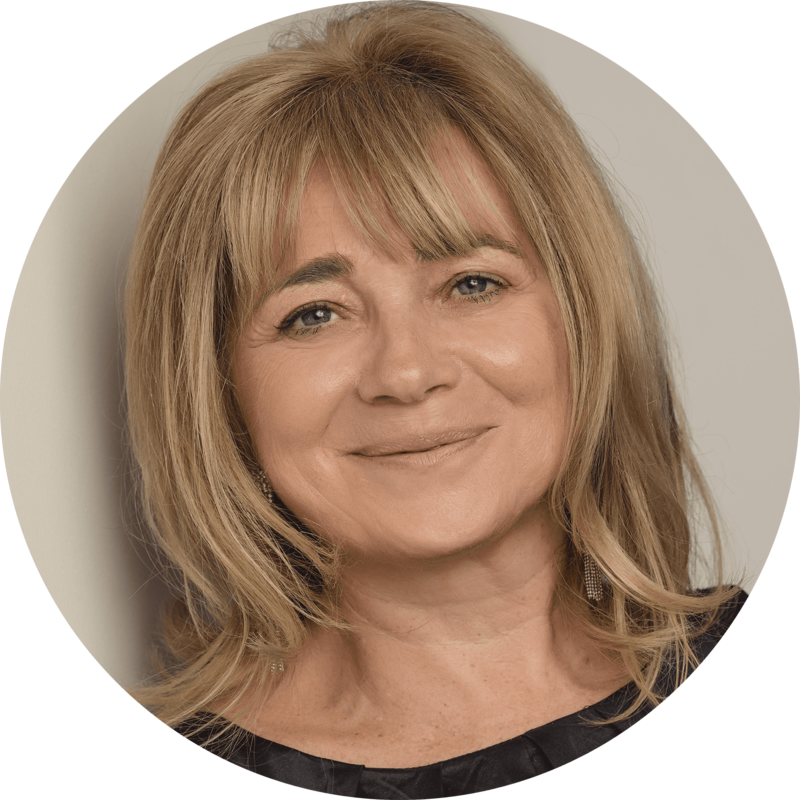 Apparently, they are roped up, lifted hundreds of metres from boats and left for half the season before being rounded up and winched to the other side of the headlands for the second half. Slaughtering takes place in October. The sea birds shriek overhead. There aren’t huge numbers of them (the dramatic rock formations are the draw rather than the bird life) and they can dive with impunity, knowing they are well out of reach. The islands may be pretty but they’re certainly not cheap. Dinner tonight in a quayside grill. Two courses (langoustines and lemon meringue pie) and two cocktails – ninety pounds. Perhaps it’s because it’s The Restaurant at the End of The Universe (though no Pan Galactic Gargle Blasters in evidence, just pisco sours – at least I won’t need my towel). It’s the only reason I won’t be be sad to go home. The Faroe Islands is a self-governing archipelago, part of the Kingdom of Denmark. 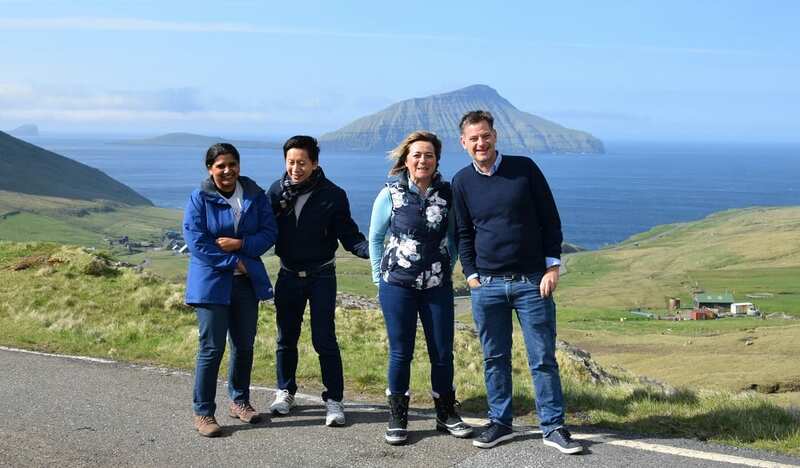 It comprises 18 rocky, volcanic islands between Iceland and Norway in the North Atlantic Ocean, connected by road tunnels, ferries, causeways and bridges. 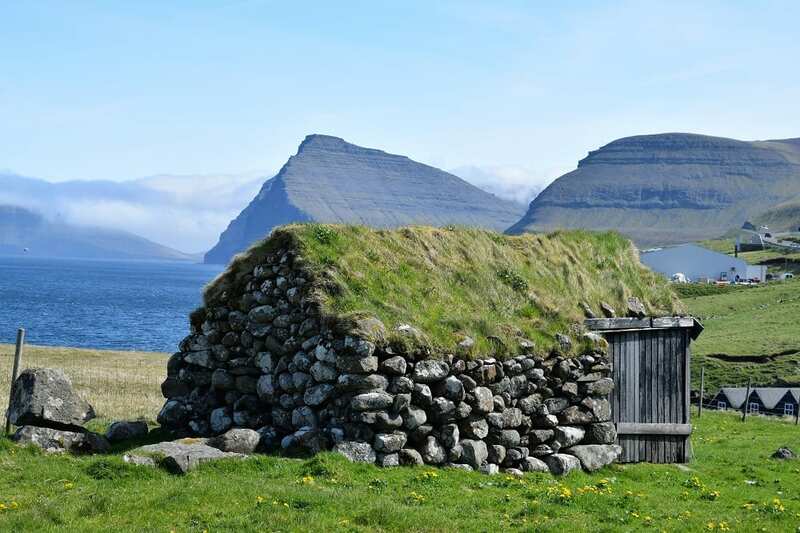 Irish hermit monks are now thought to be the earliest settlers of the Faroe Islands. They arrived in the sixth century, bringing with them sheep as well as early Irish language. The Vikings landed sometime before 900AD. The Faroe Islands, formed by volcanic activity 30 million years ago, are now a cultural melting pot with 77 nationalities forming a population of only 48,000. The Faroese language, spoken by all Faroese people, is most similar to Icelandic and the now extinct Old Norse language. English is also widely spoken, especially among the younger people. National Geographic recently elected the Faroe Islands the world’s most appealing island community, out of 111 island destinations worldwide. The Faroese are, apparently, noted for their friendliness. 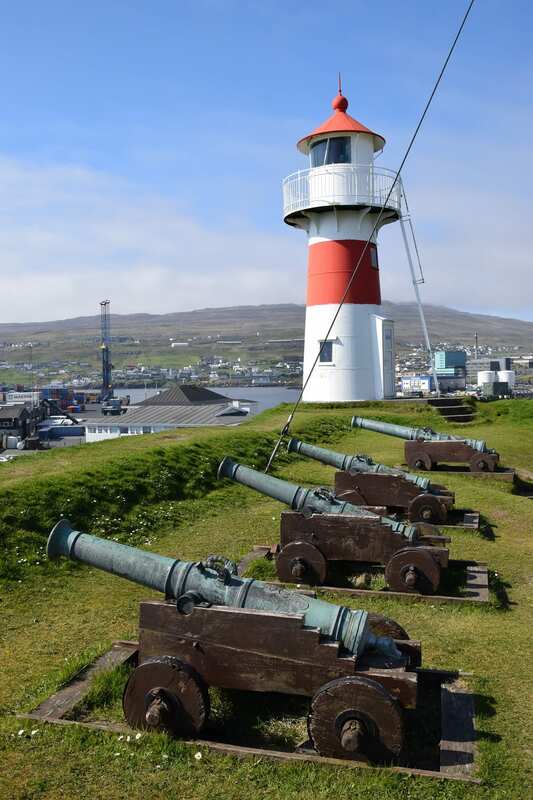 To see more of my photos of the Faroe Islands, visit this page.